Blossom Harness for Dogs w/Matching Leash! Oh so sweet and practical. Walk your diva dog in style with this adorable harness vest and cute pink leash to match! So cute and functional! Pink & Green Harness vest with velcro closure and d ring. A matching ..
Includes Matching leash! Cool Netted Mesh Proprietary Nyla-bond D-Ring connection for s.. This adorable dog dress was created for the 2012 MTV Movie Awards! This is gorgeous dress is m..
Holiday Red Plaid Doggy Dress w/Harness and Leash! This dress is perfect for holiday gatherings. Harness dress with a d ring and matching leash made.. Stylish and functional, these walking harnesses are made from breathable cotton in beautiful vibrant..
Julian Harness Top for Dogs! Fierce! Harness fit for a fashionista with cheetah prints! Velcro closures. 100% cotton PO Size ..
Sporty Denim Harness! Sweet harness made with pockets and spread collars. Adorned with top stitching.. Chic harness with lace and rhinestone trimmings. Pink lining. Velcro closures. 100% cotton. PO Siz.. This ultra modern dog harness tank with rhinestone trimmings will have your furbaby strutting with s.. The Lola Dog Harness Top is a sweet, pink harness with a bow, rhinestones, and lace trimmings. It ha..
Peppermint Gal Holiday Doggy Dress w/Harness and Matching Leash! This adorable dress is perfect for the holidays! This harness dress has a d ring and matching lea..
Sweet Strawberries! Adorable harness with lace and rhinestone trimmings, a pink lining, velcro closu..
Linen vest style harness with lace ruffle trim. Velcro closure. Comes complete with matching leash. ..
Fun & Bright Hawaiian Dress features Brilliant Colors of the Islands. Comes complete wit.. This adorable and fun Blue Polka Dot Dress is right in step in the new colors of Spring. 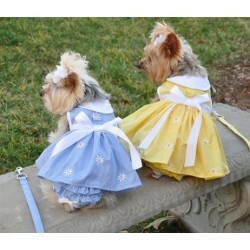 Great ..
Super sweet harness with pocket, ruffles and spread collars. Adorned with rhinestones, top stitching.. Your little bride will be so beautiful walking down the aisle wearing this elegant and fully lined, ..
Soft and Pretty......Pastel Yellow Floral and White Lace Dog Dress with Spring Green Polka Dot Bow. ..
Fun and whimsical for you and your pup! This designer dress features an Embroidered Ice Cr.. Crisp and Cool Designer Hawaiian Dress! Comes with a D Ring allowing this dress to be u..